Adam Sorenson's designer trees at Stumptown. all it a perfect storm, but Portland is in high gear as an art incubator. Last month I saw fresh work from Dan Ness, Nic Walker, Adam Sorenson and Joe Biel, as well as blue-chip work by Susan Rothenberg in my gallery goings. It's all worthy work that I'll include within my review of this fledgling renaissance. The Portland art scene's current heat makes sense. Portland is a city where most of the things that were swept under the rug during the late 20th century became conscientious talking points about community, the individual, cultural invention, man's place in nature and the necessity of bohemians, as well as variegated and intelligent urban development. When most U.S. cities went blithely on screwing themselves, Portland planned and there is an almost Roman civic sentiment amongst the citizens. This is the place to go against the purely hierarchical flow and I think of Portland as a rebel base. The upcoming Core Sample, Oct. 11-19, should display an incomplete review and follow up the momentum set by earlier shows this year. The real test will be the solo shows of 2004. Some have pointed out that this has happened before, but it hasn't happened on this scale with so many leaders and definitive events. Sometimes smaller eruptions set the stage for larger ones. Yes, we have the highest unemployment in the country, but most of the key people are employed and attention from elsewhere continues to build. We are not a media hub and simply need to make noise to get credit where it is due. Those of us who were kids during the '70s, '80s and '90s recognize Portland as the one major American city unwilling to screw itself, and it seems open to the idea of being a national leader. I think of Portland as the conscience for the country, not so much isolated as different. It reminds me of one of my favorite plays, Ibsen's "An Enemy of the People." Portland is not going to be Houston, Atlanta, L.A., Seattle or New York; it's a rebel base for thinking people. Portland is a city where respect is not just a human-to-human thing and the Gen X- and Y-ers moving here uphold that tradition. They bring new ambition and competitiveness even when they say they aren't. Overall, the city itself is not the final issue; it's the rigor and savvy of its individuals. New work from Nic Walker. Still, longtime Portlanders do have this knee-jerk reaction to newcomers. Half the time they assume we are trying to remake Portland into New York; the rest of the time they say Portland "just can't ..."
That said, this month's Core Sample should solidify what has definitely been a good start to a cultural renaissance in Portland. It still needs dialog and I would like to see stronger written statements from artists. But mark my words: With the new museum wing opening in 2005, Portland will officially have its time in the sun. Galleries get ready, artists sharpen your sticks and scenesters kiss that person you have been aching to kiss ... it's time to get it on. One-time Portlander Joe Biel at Mark Woolley. Still, despite this lack of definitive writing by artists, this is a strong scene visually and that's what matters. A key factor in 2003 is that artists and audiences are developing quickly together  it's what Dave Hickey calls "communities of desire." Truth be told, words (especially catch phrases) are for the rest of the world. If you want to counter my account then do so, otherwise silence breeds what D.K., Richard, Michaela, Sue, Pat, Chas, Camela, Morgan, Matthew, Harvest, Steffen, Phil, Katherine, Daniel and I write in various Portland publications. I ask: Are you OK with the history we are bastardizing, coloring and oversimplifying? If not, start writing. 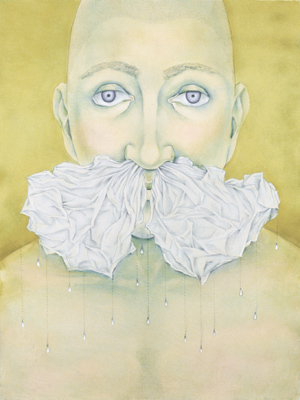 The standout show in September was Adam Sorenson at Stumptown Coffee. His Matisse-like work wears the Oriental imprint well. 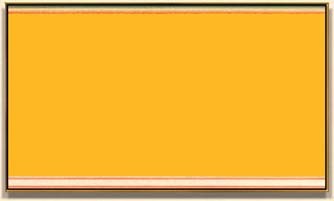 He has a nice touch as a colorist and this makes his work seem lighter, more immaterial than the heavily worked paint surfaces often belie. Instead of paint, the works almost seem like rice paper  a rare attribute that separates his work from Gary Hume's, which is harder and colder. 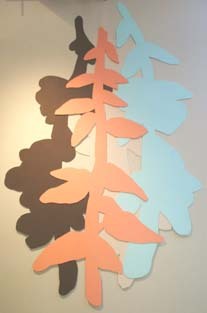 Still, Sorenson can learn from both Matisse and Hume's economy. I suggest checking out Jean Hellion, whose color courts airiness itself. Sorenson has obviously grown since the recent Biennial and I love the fact that we see this in a café. 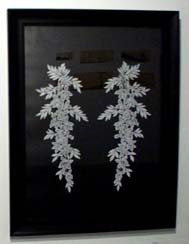 The new work is less contained and he makes more confident use of his leaf-like forms, nonchalant lines and arabesques. 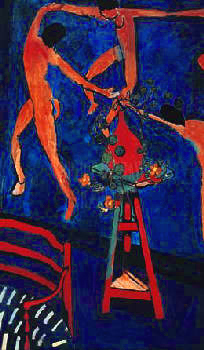 Matisse's "La Danse with Nasturtiums," 1912. Soon those elements will congeal even more. I particularly like his odd approach to scale, foreground and background, which remain in constant flux. Where he needs a little work  and I mean only a little  is the painting surface. In many paintings (no titles at the show), there were zones that were extremely overworked, showing the struggle of the painter. In other spots they were effortless and the incongruity of the zones made his work seem as if it was second-guessing itself (not in a good way). Either highlight the texture changes or unify the texture. For an example of highlighting texture changes, there is Matisse's great "La Danse with Nasturtiums." It is a painting of paintings; so much for "meta" being a late-20th century invention! Last month at the Los Angeles County Museum of Art, I came face to face with this Matisse, which is normally in the Pushkin Museum. The right-side edges of the orange stool and the blue background are heavily reworked and I can see heavy traces of previous brushstrokes next to the orange dancing bodies in the adjacent blue. Yet these vestigial traces eventually blend into a huge sea of ultramarine. The dangling Nasturtium plants are nonchalant and the orange and ultramarine color scheme sears the eyes. It is this textural highlighting of the reworked area (particularly strong by the orange dancing bodies) that bridges the nonchalance of the plant, the aggression of the red stool and the vastness of the ultramarine blue background activated by the dance. 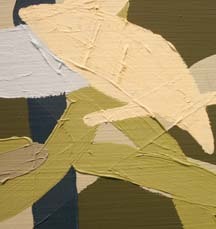 The texture gives us painterly ghosts of Matisse's struggle. The alternate strategy would be to unify the whole surface, like the excellent Susan Rothenberg at the Elizabeth Leach Gallery ... as you move closer to the painting surface the brushstrokes seem to evaporate. 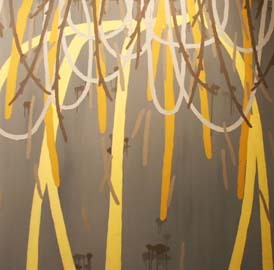 The final pieces in Sorenson's show were two cutout groves of pine trees painted in his pop-like color schemes. This nod to the forest highlights another advantage Sorenson has in this Pacific Northwest environment: an enhanced attention to intrusive foreground figures that activates negative space ... such as those tree branches. His enhanced perception of space allows him to mess with perceived scale and the overall orientation of the viewer to the work, not an L.A. thing or a New York thing, but definitely a bit like Chinese scroll painting. 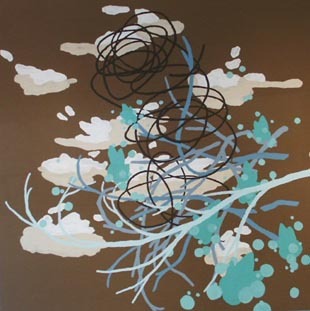 In a way, Sorenson's decorative work could not be further from wallpaper with its fun activated cosmos of loops, leaves and other forms, because its ambiguity is so demanding as pictorial space. In the late 1980s, First Thursday was started by William Jamison in the then-fish-smelling Pearl District. In 1995, PICA was founded by Kristy Edmunds and, since the Portland Art Museum had scant interest in a contemporary art program, the institution had several itinerant warehouse shows. PICA held down the fort. When Jamison died in '95, the city grieved and things slowly re-germinated. I visited in '98, while on the way to pick up my masters degree and to participate in a show at L.A.'s convention center. I moved here in 1999 and sensed a gaping hole, but did not yet understand it was left mostly by a single man. I think of Jamison like Obi-Wan Kenobi  when Darth Vader cut him down his example and spirit spread out, becoming "more powerful than you could ever imagine." 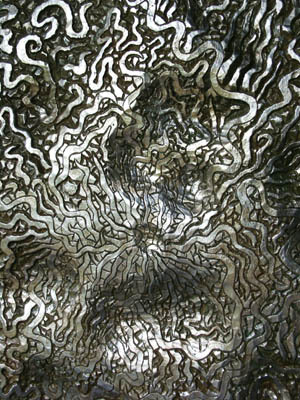 Detail of Heidi Schwegler's work. One video piece repeated "I'm sorry." Michael Knutson and Heidi Schwegler were the stars, but the show also featured Sean Healy, Tom Cramer, Mike Shea, Storm Tharp, Molly Vidor and introduced us to Brendan Clenaghen. Kanjo even recruited Jacqueline Ehlis, who was still in graduate school at UNLV (arguably the hottest graduate program on earth during the '90s). The show pissed off people with its garbage sculpture, tarot cards and Swallow Press, but it absolutely set the stage for what's going on now. Today  tellingly  the show would be instantly accepted. Also in 1999, Jamie Bollenbach, a Reed student and former head of the ACLU in Alaska, worked with the college to create The Bollenbach Art Labs at Southeast 3rd and Alder (now called _Hall). Its purpose was to give Reed students a gallery to show in, along with cheap studio space. Notable was the work of Ed King. In spring 2000, PICA invited all the artists it could fit onto its walls; 493 showed up, and waiting in the hours-long line was where many artists started to talk to one another ... mostly about how crass a promotion it seemed to be for PICA. I think it had a lot of good side effects, though, and was a common precursor to The Portland Independent Salon, The Modern Zoo and Meeting People. In summer 2000, Todd Johnson curated Popcicle, a damn good show at the Everett Station Lofts. Johnson is currently the preparator for the Art Gym and probably the most adept curator in Portland today  very precise and as untalkative as I am chatty. Hardly anyone noticed Popsicle in the press, but artists started getting more serious at the lofts. Not coincidentally, Muriel Bartol opened Nil Gallery in the lofts (where Field currently is) and her exhibition program was very good, outstripping anything that has been done before or since in those galleries, and rarely equaled by the official galleries. She is going to Art Center in Pasadena, Calif., but longs for Portland. Go meet her; she has a show at Field this month. 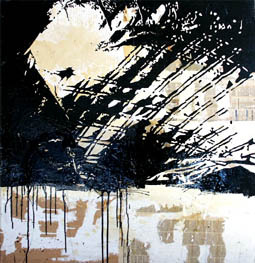 Noland's "Air Beauty" from the Greenberg Collection. Also in 2000, the Bollenbach Art Labs became the site of Cris Moss' first Donut Shop show featuring himself and several other installation/video artists; it garnered good press in the Willamette Week. Two months later at the labs, I staged a three-person show with Nic Walker and Kelly Newcomer. A good deal of art sold for not insubstantial sums. Moss continued to do donut shops, most of which looked good. Later that year the Art Museum acquired the Clement Greenberg collection, signaling big changes in the museum's direction. With the addition of these two curators also begins a series of great lectures, including Peter Schjeldahl, Dave Hickey, Robert Storr and Larry Rinder. These lectures are very important and Portland just doesn't seem isolated anymore ... unless of course you are lazy! Hildur Bjarnadottir and 2001 Biennial. 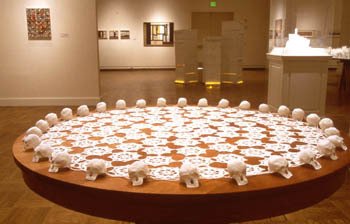 In 2001, the Oregon Biennial took place with standout work by Rae Mahaffey, Jan Reaves, Mark Smith, Melody Owen and, especially, Hildur Bjarnadottir. Still, it seemed safe compared to 1999, which had twice as many standouts. Curatorially, the new space is kinda blocky and that needs to be addressed. But every Biennial I've seen (the last three) had some great work. 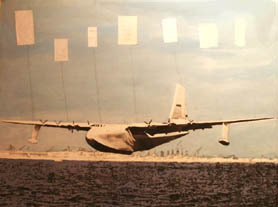 Red 76 (Sam Gould) and the Alphabet Dress (Zefery Throwell) took Moss' traveling-show system and added a large-scale party element. Disjecta worked with both organizers, as well as independently of them. Also in 2001, a small, simple protest to the Biennial took place at Groundswell on Alberta Street and Bruce Guenther showed up. Then a show I had planned for nine months, "The Portland Independent Salon," took place at the Bollenbach Art Labs. Portland Independent Salon: Works by Natalie Davis, Liz Obert, Muriel Bartol and Michael Hernandez (L to R). It was a huge 11,000-square-foot success, not unlike the Modern Zoo, only with a more consistent nod to quality. Like the Zoo, it was unjuried, but it differed in that each artist was simply given nine feet of wall space, first come, first served. Randy Gragg wrote critically on the show ... to this point only the Donut Shop had gotten mention and nobody said anything much more critical than "it looked good." 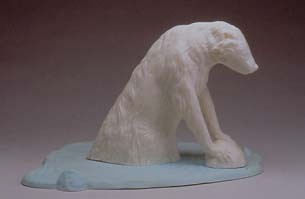 Jensen's "Skunk takes a Bath" at PICA, 2001. The Donut Shop traveled to Bellingham, Wash., proving this scene can and will travel. On the institutional side, PICA's programming included excellent shows by Erica Blumenthal, Malia Jensen, Kate Shepherd and Harrell Fletcher. All were a bit too clean, but Jensen had the strongest work. Her "Knotty Situation" is without a doubt a museum piece. The Lab, a mock institution, kicked into gear with a lecture series that took on practically anything. The David Lynch-approved beverage, Pabst Blue Ribbon, had unsubstantiated reports of being consumed. One notable lecture series person wisely chose Hamms, "the beer refreshing." The apotheosis of the lectures was with our favorite fake professor, Amos Latteier. Latteier delivered an SCTV-worthy lecture on models. The wonderfully terrible Lego sheep are worth checking out (you can stream it here: www.Latteier.com). 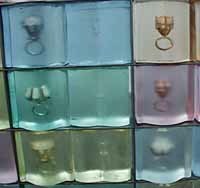 In winter 2002, the Charm Bracelet put on the "Meeting People" show. The idea was that 500 artists would create uniformly small, square works. It was a striking success as a community project, but there were sly overtones that many caught and distrusted, such as being used as a number to substantiate a project. 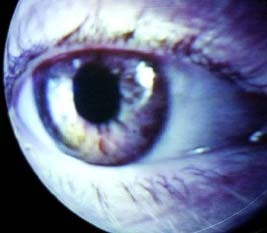 A rift developed between "primary participation" and "visual efficacy" artists. Both sides have conceptual aims, but I argue the shows that emphasize participation above all else do so to the detriment of deeper conceptual rigor. The artists themselves get little out of it. Robert Smithson and Vito Acconci it ain't. Both Smithson and Acconci could and did write. I'll believe a work's conceptual rigor when it starts laying out strong conceptual arguments in print, gets more provocative on a one-to-one basis or gives out directives to the crowd like "storm the Bastille." Until then it is "We are the World" media op. Harrell Fletcher had a show at PICA, "Everyday Sunshine," in 2001. A lot of the "primary participation" artists seemed to take their basis from Fletcher, but he can and does converse about his concepts with considerably more eloquence. These younger conceptualists have a grace period but, at some point, you have to be able to defend yourself conceptually  especially if you are a primarily conceptual artist. Gordon Matta Clark sawed houses in half and was eloquent about it ... balls and brains = artist, folks. The Fleck Gallery anchored the Everett Station Lofts along with Zeitgeist. Field also emerged in the former Nil space; Michael Oman Reagan had been Gallery Nil's other programming voice. Emily Ginsberg Wallpaper from "Subscribe." In spring 2002, Pat Boas curated Slowness at the Art Gym. Was the show possibly sparked conceptually by the title of Milan Kundera's book? Only Emily Ginsberg's video effectively slowed anything. Most of the work was very elegant, but seemed too similar  as if the general absence of color is a visual code for effecting slowness. It was a show that simply combined too much of the same thing and became flat, and I decided dynamics are key to any group show. 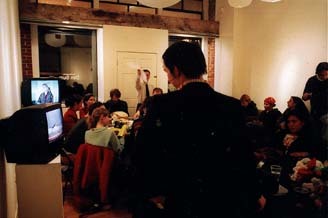 Other flat shows in 2002 included Northwest Narrative at PICA. Ehlis' solo show at Savage was the first by a local artist to realize the potential of the Savage Gallery (although the long wall-hang was adequate, it could have been better). Savage as a space was so tough that many top international artists would have to plan for a year to pull off a show. The gallery closed this year, and only seven of its shows in 18 months really fulfilled its promise to any degree. Heidi Schwegler, Diane Kornberg, Bryan Hunt, Suen Wong, Ehlis and Heidi Cody were among them. Ehlis is a cut or two above the rest on the longwall at Savage. Matt Fleck, Marcello Munoz and Jim Archer curated Next Now at the Littman Gallery; standouts were Laura Fritz, Marcello Munoz and James Boulton, whose "Spark Gap Transmission" was one of the stars of the recent Biennial. My show, Play, also at the Littman, was an experiment in playful competition and interaction amongst artists who were not necessarily friends, but became so. Unique for indie shows, it took a year of planning and it obliquely referenced Sept. 11. It was a concerted effort to raise the stakes. With a postgraduate level thesis and color catalog, there was hope that others would attempt similar intellectual and aesthetic rigor. Many whined instead, but attendance was great and many good vibes came, too; a serious press fandango signaled everyone to wake up. Also in September 2002, The Organ, a publication devoted to the arts in Portland, published its first issue. In November, "Maritime" and "Hug Me" opened at _Hall and Pacific Switchboard, respectively. The two shows were baptized when James Boulton and Adam Sorenson from "Maritime" and Cynthia Starr from "Hug Me" got into the 2003 Oregon Biennial. The kids are alright! At some point, letters to the editor at this publication develop, as does some sort of rift between the "Hug Me's" and "Mods," as two young art camps emerge. I suspect the Hug Me's are on Prozac and the Mods come from well-to-do families (and lack Prozac), but it all seems odd to me. The psychic condition of the two alleged camps is interesting, though I think I'm from a different and rarer camp, whose parents never divorced. Is Prozac bad for art? In January, Beamsplitter's MachineWorks outed video both international and local, and coaxed Portlanders into a dark, possibly toxic, but excellent environment. I suspect few entered the Biennial. In March, Red 76's glorious polyglot of international and local DIY offerings defined the idea of protean artistic impenetrableness at the Laurelhurst Theater. Too many tried wrongly to understand it as a whole; that was impossible. Instead, it was a smorgasbord of ideas in need of distillation  a tantalizing prospect in a city full of artists. IAE was the armory of indie … although I think fetishing DIY is a mistake and a bit like those '90s discussions of "who's more alternative?" There can be a convenient sense of a-historicality to the punker versions of this artus operandi, but I don't think history should be sold so short; die Brucke, der Blaue Reiter, Nabis and even the Impressionists were all indie and aware. We should call it like it is … the Avant-En-Garde not only exists, it is popular today  especially in Portland. Isn't the 21st century looking more interesting every day? 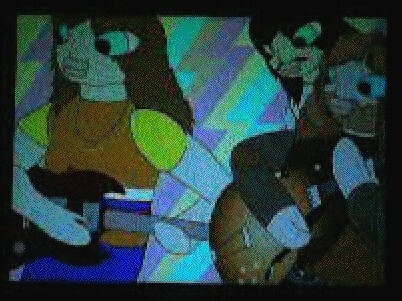 Video still from "Cablevision" at I.A.E. It doesn't matter if it happens in a basement or a higher-profile warehouse by people with graduate degrees. If it's fresh, it's worth promoting and sharing. The arts die primarily because of neglect, not through knowledge of what is happening elsewhere. Next in 2003, Brad Adkin's Blood and Guts Forever show at the Art Gym showed us less about friendship than a study of psyche, failure and fragility, all important themes. It looked good, if not a little timid, for such a feisty title. Frankly, that's how most Art Gym shows look (David Eckard exempted, of course!). 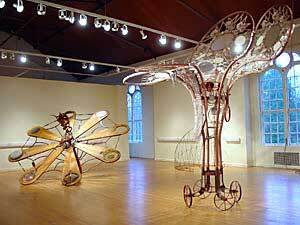 In fact, Eckard's Art Gym show wins my vote for most fully realized 2003 exhibition involving Portlanders. Group shows are nice but always a bit too scattered; we do them to understand the moment. Statements are for individuals. Call it a wake-up call, and a bit like going to a gym to build one's art-viewing muscles accustomed to sterile walls. Portland stood up and out in these honest, less digested environs. Unlike museum and gallery shows, it was not aimed at novices. Thousands of curators convened nearby and connections were made. It created a concrete example nationally about the buzz Portland has had for over 10 years. Next, PCAC's Modern Zoo grew and evolved to fill a 100,000-square-foot corporate complex. For three months everyone, regardless of chops, intellect or taste, was invited ... anything could and sometimes even did happen. I don't disparage the lack of curatorial control; it was a great way to organically engage the scene. By being so amorphous it took a baseline temperature of the city and, consequently, forced everyone to think about what they really want to do next. What this means is everyone just got better and expects more. It wasn't a showcase like the other shows of 2003, it was an experiment and a concerted field observation/testing. In 2003, the Oregon Biennial, normally the bellwether of taste, provoked a lot of discussion due to its comparatively rear-guard stance and comparisons to the Modern Zoo. This alone verified that a new standard is now in effect. Taste alone is no longer enough. Portland is more demanding now, and we've grown to like both taste and energy. It must be said that being a juror of any biennial or official survey is an impossible but very important job. Lastly, PICA's Time Based Art Festival (TBA) was impressive and picked up on the cascading energy that all of these events are creating. The MachineWorks was a big, rousing part of the success, and I caught Daniel Bernard Roumain. Roumain has a gift for layering but lacks the technical brilliance on the violin to really take off (but as violist with gypsy blood, I'm picky). TBA frees up resources for Horodner's visual arts program for the rest of the year. I must note that the William Pope.L eRascism exhibit was one of the very best shows on the planet this year. TBA gives Portland a badly needed yearly festival to tout. Once again, the catchphrase is important here. I think TBA highlights PICA's importance to the community, which people can and often do take for granted when regular monthly or weekly performances take place. A festival gives "now or never" immediacy to seeing arts events. Suddenly, between IAE, TBA and others, Portlanders are seeing the local world and the rest of the world side by side ... very quickly that odd and undeserved self-deprecation of Portland art (by those who have been here forever) is vanishing. People are shutting up and doing something. With PCAC becoming more focused in the upcoming "process" show, they have the opportunity to prove themselves in a critical way. What's next? I see a real necessity for large-scale solo and duo shows. 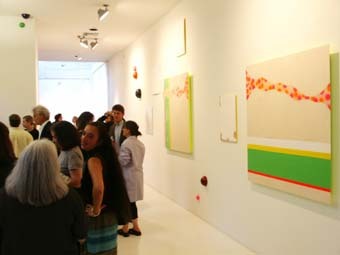 For starters, make sure to check out Tom Cramer's show, which fills the entire Mark Woolley Gallery (through Oct. 31). It's a crushing tour de force showcasing two years' worth of work. Never have I seen such a combination of sustained visual potency and diversity within a solo show in Portland  that includes artists from outside the city who have shown here. Cramer is an artist at the height of his powers. Finally and beyond all that, stronger written statements are necessary. If you're curious about how to make that happen, you can always email me and I can point you to resources.